How to Backup iPhone XS Max/XS/XR/X/8/7 and More? The straightforward guide will kick the obstacle away and tell you 3 ways of how to backup iPhone XS Max, XS, XR, X, 8, 7, 6, Plus and more, assuring the safe iPhone data preservation during iOS update or in case that the iPhone is stolen, lost or damaged. A good and considerate backup strategy offers a reliable protection to your precious iPhone data files, of course. How to backup iPhone in case that your iPhone is stolen, lost or broken? Or how to keep the data safe during iOS update? In fact, it is not that difficult thing to backup your iPhone contents like photos, contacts or messages as long as you get the right tool. No matter you need a tool that is free or in charge, or capable of full backup or selective backup, you can find answers here. How to Backup iPhone to Computer in Bulk and Selectively? No more worries, there is a tool that can satisfy these two needs at the same time. DearMob iPhone Manager, a professional iPhone backup software, can allows you to fully backup iPhone data to PC/Mac and restore in one click, as well as selectively backup iPhone photos, music, videos, contacts or messages one bye one or in batch with no data loss. * Password encrypt iPhone backup;. 1. The most straightforward benefit for us of iPhone backup is to protect the iPhone data securely, be it private photos, sensitive videos or important contacts. If your iPhone happens to be lost, damaged or stolen, you still have the chance to get back these valuable iPhone data files by restoring iPhone backup. 2. When you need to upgrade your iOS to the latest iOS 12, you are suggested to backup iPhone before iOS 12 update to prevent data loss. 3. If you have a plan to switch to a new iPhone XS Max, XS or XR, you definitely need to move all data files on old iPhone to the new one. That's why we backup iPhone data first and restore thereafter. How to Backup iPhone Contents to Computer Selectively? iCloud is the built-in feature that every iPhone shipped with iOS 5 or newer has. As long as you turn on the iCloud backup feature and make sure there is enough cloud space, iCloud will automatically backup your iPhone to cloud over the air. Step 1. Connect your iPhone to the WiFi network. Step 2. Tap Settings > your name > tap iCloud. If you are using iOS 10.2 or earlier, go to Settings, scroll down and tap iCloud. Step 3. Tap iCloud Backup and turn on it to tap Back Up Now or allow automatically backup data such as your accounts, documents, Home configuration, and settings when your iPhone is plugged in, locked and connected to WiFi. If you do not need to backup the whole iPhone, you can switch on specific option in iCloud like Photos, Contacts, Calendars, etc to backup certain iPhone files to iCloud. Step 4. 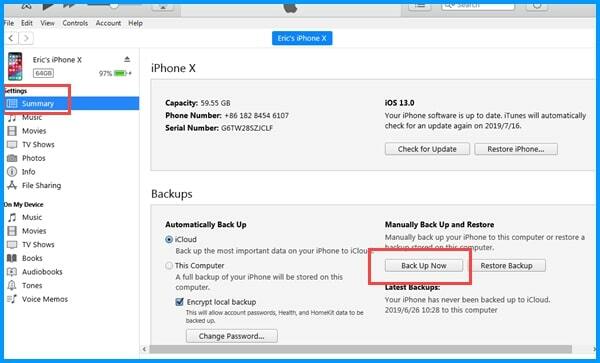 To check whether the backup is completed, you can go to Settings > [your name] > iCloud > iCloud Storage > Manage Storage, then select your device to see the details with time and backup size. * Backup iPhone to iCloud within 5GB is free. If you need more storage space for more large files like photos and videos backup, you need to pay $0.99/month for 50GB storage, $2.99/month for 200GB and $9.99/month for 1TB. * Strong and stable internet connection is required, otherwise iCloud backup would take hours or days. iTunes is much more considerate as it is free and capable of backing up almost all data files from iPhone to PC/Mac, though it is a manual operation and often needs a USB cable to transfer the data. Step 1. Launch iTunes and USB-connect your iPhone to computer. Make sure that you have allowed your device to trust the computer. Step 2. Once connected, click on the phone-shaped icon in the left menu bar. Then you will see your iPhone details and the backup options. Step 3. Now, click on the Back Up Now button in the right part to backup your iPhone to iTunes. After backup, the backup time will be shown below the Back Up Now button to facilitate restore iPhone backup later. If there's any private or sensitive data that you want to protect, you can check Encrypt iPhone backup in iTunes before backup to lock them safely with a password. 1. iPhone backup using iTunes will be stored in system on computer by default and the backup location is unchangeable. So, check if there is enough space of your computer's hard drive for the full 256GB, 128GB or 64GB iPhone backup. 2. iTunes backup is a full device backup method, so it is impossible to selectively backup iPhone photos, music, videos, etc one by one. 3. You can see whether your iPhone backup succeed or not in iTunes Preferences, but you are not allowed to view the iTunes backup files on computer. * Content from the iTunes and App Stores, or PDFs downloaded directly to iBooks. * Content synced from iTunes, like imported MP3s or CDs, videos, books, and photos. * Photos already stored in the cloud, like My Photo Stream, and iCloud Photo Library. How to Backup iPhone to PC/Mac Computer Selectively? Though iTunes is powerful enough for you to fully backup iPhone to PC or Mac computer, what if iTunes won't backup iPhone problem happens? Besides, iTunes is unable to choose specific files to backup, so you can't choose one photo, video, contact, etc to backup to computer. Worse still, you have to spend much time waiting for the full backup for iPhone though you just need to backup a small part of your iPhone contents, and also restore the whole backup to get such things back. Time-consuming, aha? Now that iTunes can't satisfy your needs of selective backup iPhone to computer, you need to turn to DearMob iPhone Manager. As the best iTunes alternative for full iPhone backup, DearMob iPhone Manager also acts as an iPhone data transfer and backup software to enable iPhone users to manage iPhone files, sync data between iOS and computer, and selectively backup iPhone to Mac/PC like photos, music, videos, contacts and more at will. How to backup iPhone to computer via DearMob iPhone Manager? 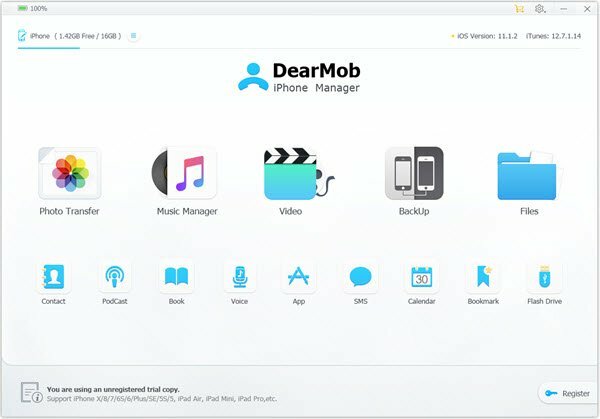 Before backup, download DearMob iPhone Manager, install and launch it on your computer. USB-connect your iPhone XS Max/XS/XR/X/8/7 etc to computer and tap Trust This Computer on your iPhone to make this iPhone backup software to recognize your iOS device, and then follow the guide below. Click on Backup icon on the main UI of DearMob iPhone Manager, and then you are allowed to backup and restore iPhone, as well as encrypt the iPhone backup with a password. Go back to the main user interface of DearMob iPhone Manager where 12 types of iPhone data are allowed to be managed via this iPhone backup software. Just click on the one you prefer, and freely backup certain iPhone files to computer safely. * DearMob iPhone Manager could handle almost all types of iPhone data that you generate in daily life, including photos, music, videos, files, contacts, PodCasts, ebooks, voice memos, apps, messages, calendars and bookmarks. * This iPhone backup software currently supports iPhone XS Max/XS/XR/X/8/7/6S/6/Plus etc shipped with iOS 12 and earlier, and can operate on Windows 10/macOS Mojave and earlier. * To make Windows PC to recognize iPhone, Apple Application Support and Apple Mobile Device Support are needed by nearly all third-party iPhone backup software. However, DearMob iPhone Manager has no such needs of Apple services so that you can backup iPhone to computer without iTunes easily. If your backup requirement is simple, you can simply choose iTunes for full backup or iCloud to backup iPhone important files like photos and contacts. If you want to back iPhone to Mac/PC computer in bulk or selectively fast and with no data loss, you are suggested to choose DearMob iPhone Manager. DearMob iPhone Manager makes things easier than ever before no matter you want to backup iPhone data for safe collection or transfer photos, music, videos, contacts, etc between iPhone and computer.